Thank you to all who came along to the street party on Tuesday and helped make it such a day to remember. It was fantastic to see such a great turn out, despite the weather. But it soon became clear that we weren’t going to let a bit of rain stop us enjoying ourselves. Many thanks to all who helped set up and pack down. 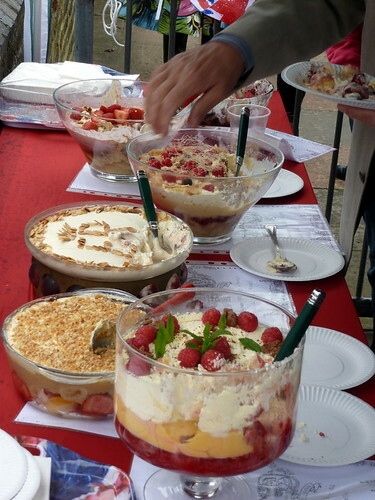 a “big thank you” to the participants in the Grand Trifle Competition, 6 wonderful trifles, all beautifully presented and individually decorated. Everyone really excelled, there was spun sugar, Elizabeth II inspired touches, a modern apple & gingerbread variation, fruit of all types…..oh, and a fair amount of alcohol ! A non-stop queue of enthusiastic “tasters” deliberated over, and votes were given for, their favourites, and later in the afternoon our guest judge Sorrel Ferguson (the talented chef of the Garden Museum cafe) arrived eager to sample the indulgent desserts and give her verdict. Adrian really only entered to “make up the numbers” and gives full credit to Nigella Lawson for her fantastic recipe ! 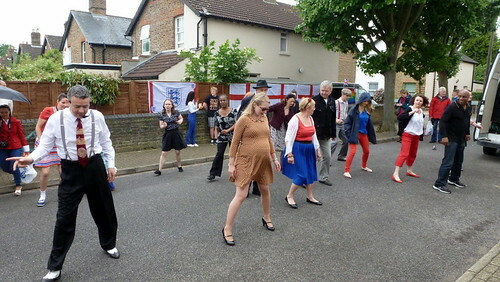 The Lindy Hop dancing was a big hit thanks to Niall Oates and his dancers (and music) who demonstrated and got lots of residents up on their feet in spite of the wet conditions…… a number of people have suggested we have them back for another event…… indoors ! A great idea !